Not much to say about this loser that hasn’t already been said. The new rising star of the Republican presidential hopefuls is a former governor of Arkansas with a few choice attributes that make him the perfect Republican. He equates homosexuality with pedophilia and necrophilia (perhaps an association made by spending too much time in Church), refused to retract his absurd 1992 comment that people with AIDS should be quarantined, and is one of those self-appointed soldiers for Christ, to whom the fringes on the religious right gravitate like flies to feces. As revelation after revelation of the CIA’s torture policies under the Bush administration swirl with headline grabbing attention, Huckabee released a Christmas campaign ad in which he states: "…what really matters is the celebration of the birth of Jesus Christ." More disturbing are the stories surfacing about his son, demonstrating that his parenting skills are on a par with those of Rudy Giuliani. Aside from an incident in April this year where David Huckabee was arrested at a Little Rock, Arkansas airport after a federal X-ray technician detected a loaded Glock pistol in his carry-on luggage, it appears that Mike Huckabee involved himself in a childhood dog-killing cover-up, the details of which would make Jeffrey Dahmer quiver in delight. 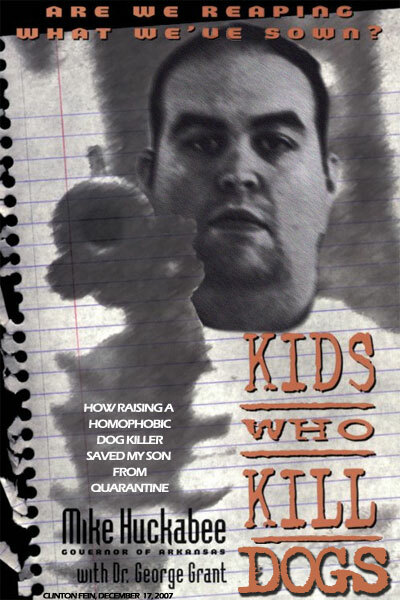 In 1998, David Huckabee was unceremoniously booted out of a Boy Scout camp after, serving as an ideal role model as a counselor, he killed a stray dog that had the terrible fate of wandering onto camp property. So like a good old Southerner, young Huckabee harkened back to his history by literally lynching the dog by hanging it from a tree. Then, for good measure, he slit his throat and stoned him to death. According to Newsweek, the father of another counselor involved in the incident was quoted by the Arkansas Democrat Gazette in August 1998 as saying that his son found the dog "hung over a limb and choking." Defending his son in an interview with Newsweek, Mike Huckabee responded: "There was a dog that apparently had mange and was absolutely, I guess, emaciated." Food and medicine, apparently did not factor into David Huckabee’s twisted mind. And it’s a small wonder mind you, given his propensity to eat. The Boy Scouts, more concerned in the long run with keeping out the gays, quarantine not being an option, rewarded Huckabee by later promoting him to an Eagle Scout. Mike Huckabee, who, back in 2004, shed an impressive 105 pounds stated regarding his bad eating and exercise habits: “How could I get up there and say, 'People, we've got to do better,' when I was the poster child for everything that was wrong?" While David, it appears didn’t get the memo, and looks like he could easily lose 105 pounds himself, Mike Huckabee’s divisive and un-Christian like lack of compassion continues to present him as the poster boy for everything that is wrong. As President, would he do as fantastic a job for America as he’s done raising his children? Hopefully we never find out.